Prime Minister Narendra Modi on Thursday said India is on the way to becoming a $5 trillion economy soon and hoped that the country would be among the world's top three economies in the next 15 years. Addressing the Indian diaspora here, the prime minister recounted several steps taken by his government in recent years, including several new initiatives like the Goods and Services Tax (GST), MUDRA initiative, to take India on a forward trajectory. He said that India is the world's fastest-growing major economy. Today, India's economy is on the 6th position and it will not take time to reach the 5th spot, Modi said. "It is our endeavour that India finds a place in the top three economies of the world in one-and-a-half decade," the prime minister said. "In Korea, you people not only celebrate all Indian festivals like Holi, Diwali, Baisakhi but you also involve your Korean friends in celebrations. "Now Indian restaurants have started finding place in Korean cities. Indian dishes are also being included in the menu here. Even Korean people have started knowing what is the meaning of a particular Indian dish," he said. Modi said that Indian movies are becoming increasingly popular in Korea. "Now we can also hear the voice of Kabaddi-Kabaddi among the Korean children. In 2018, Korean team won Kabaddi's silver medal in the Asian Games. I congratulate all the Korean people for this feat," he said. "I have already said that only one person can be the ambassador (Raajdoot) but every Indian, regardless of the place he lives in, is the country's representative (Raashtradoot). You are all India's ambassador," the prime minister said. India's pride has increased due to the hard work and discipline of 30 million overseas Indians, he said, adding that overseas Indians are recognised as law-abiding citizens. This year is very important for India due to the 150th birth anniversary of Mahatma Gandhi. It is such an occasion when we should remember him, take inspiration from his teachings. "Unfortunately at that time, Gandhi was not given the kind of importance and recognition which a towering person like him deserved. The world knows Nelson Mandela, Martin Luther King Jr, John F Kennedy... It is our dream that every children in the world knows about Mahatma Gandhi," Modi said. He said that Gandhi's teachings become even more relevant at a time when the world is suffering from various challenges. "There was a special place in the heart of Gandhi for environment... In his memory, we will plant 150 saplings in Korea," he said. The prime minister said that India's ever-growing ties with South Korea has always been strong and becoming even stronger. India and South Korea are stepping-up cooperation in establishing peace, stability and prosperity in the region, Modi said. The partnership between India and South Korea is being strengthened by the presence of Indian companies in South Korea. Its brands like LG, Samsung, Hyundai have reached even villages, he said. "The whole world is looking towards India with a hope. Today, India is the fastest-growing major economy of the world. Our economy has become strong. "Before 2014, we used to listen that India means one of the five fragile economies... Today, it is the fastest-growing major economy of the world. In the next few years, India is fast moving towards becoming the USD 5 trillion economy," Modi said. India is striving to improve its rankings in the ease of doing business and ease of living index, he said, adding that the biggest indirect tax reform Goods and Services Tax (GST) is now part of the system. Today, almost every Indian has a bank account. In 1,000 days, more than 33 crore bank accounts were opened. Now these accounts have over USD 12 billion, Modi said. Under the MUDRA initiative, 128 million people have been given micro-credit worth more than USD 90 billion. The beneficiaries include 74 per cent women. "I request every Indian living in Korea to at least encourage five non-Indian family to visit India once in a year," the prime minister said. Modi said India has jumped to 77th spot on the World Bank's ease of doing business ranking on the back of reforms and is determined to enter in the top 50 soon. 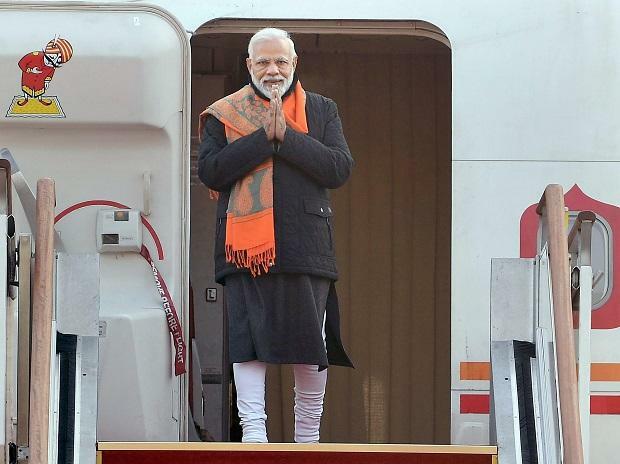 Prime Minister Modi arrived here earlier in the day on a two-day state visit. He will hold bilateral talks with South Korean President Moon on Friday. The two leaders are expected to discuss the issue of denuclearisation of the Korean peninsula, ahead of the Trump-Kim summit.